Vehicle Wraps is the common description for graphics which are applied to cars, vans, trucks, buses or boats, or any other vehicle as either a form of mobile advertising or customizing a vehicle to enhance its appearance. This gives it a personalized effect. 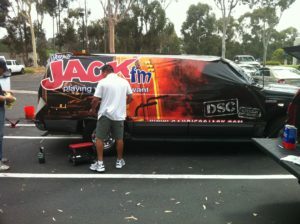 Some other related terms are Car wraps, van wraps, bus wraps, truck wraps, coaster wraps, tram wraps, boat wraps, vinyl wraps, trailer graphics or Truck side graphics. Vehicle graphics can be applied to the entire vehicle or parts of the vehicle hence the terminology Full wraps or Partial Wraps. We can assist you from design to installation. Put your corporate brand identity, logo, graphics, and contact information on them. Your potential customers around San Diego will see your trucks, cars, vans, or trailers every time you or your employees drive. 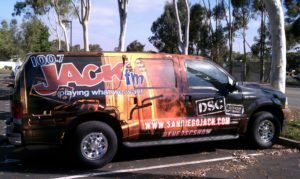 A corporate vehicle wrap is a great method of getting exposure for your company among potential customers each time you meet with a client or stop for a delivery near the greater San Diego area. 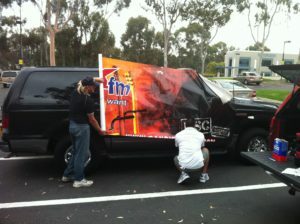 With L + L vehicle wraps you will stand out and potential clients will know how to contact you.